I really love rain. I'm sitting here in my cosy chair listening to the rain fall gently on my tin roof. For some reason the rain has always made me feel cosy. I have been known to walk in the rain. If you don't think and worry about getting to wet, ruining your hairdo, catching a cold, it is a really relaxing and liberating feeling. 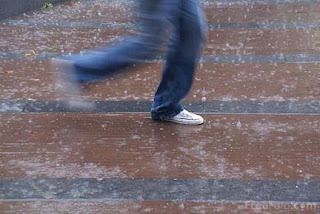 When anyone is walking in the rain you are usually surrounded by people hurrying, rushing and panicking to get out of the rain as soon as possible. But if you don't care about the wetness and just enjoy the moment, it is like you are in your own little cocoon. During one of our long hot Aussie summers and the temperature has been tipping the high 30c's and low 40c's and the humidity is soaring up there you really notice the absence of rain. Then all of a sudden the weather breaks and we get a huge downpour, ahhhh heaven. There's nothing better than standing in the beautiful soaking cooling rain drops, your whole body just smiles. Ahhhh yes, a walk in the drizzle of the rain after a hot day, now that's living! Awesome post Davine and I like how you changed your profile page, that's a very nice photo of you.